This London sightseeing map is designed to highlight the different areas within the city and help the visitor discover London in a totally new way. London is an old city and it's design and layout has developed over two thousand years. As such it has a rather unusual layout which can be rather confusing and which can mean that some visitors may be missing some of the city's hidden treasures. 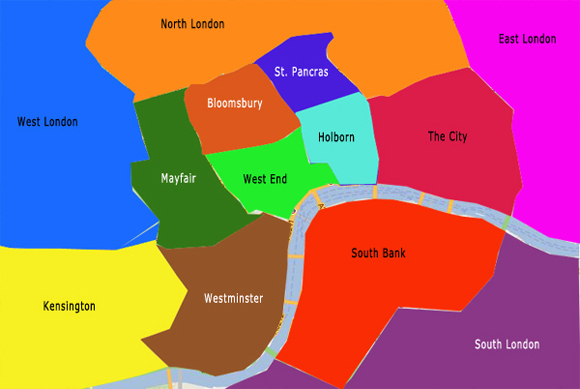 London is however broken down into smaller areas, with names obtained from the city's rich history and heritage. Each area has it's own unique feel and style and as a lifelong Londoner I hope to introduce you to them and show just how unique and diverse London can be. The nine Inner area's are walkable but if walking isn't your thing the city does have a rather excellent bus and tube network with discount travel cards available when you buy a The London Pass .